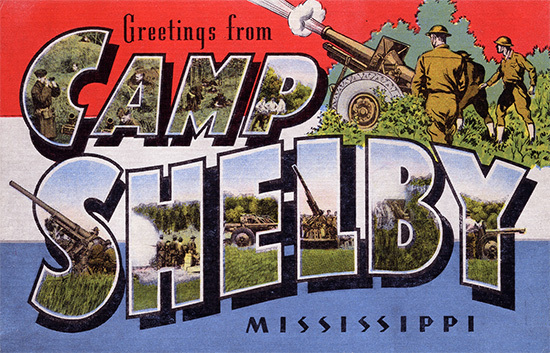 Post card from Camp Shelby, Mississippi, activation location of the 114th Evacuation Hospital. The 114th Evacuation Hospital was officially activated on 17 February 1944 at Camp Shelby, Mississippi under T/O & E 8-581 (dated July 1943), with Lt. Col. Ray E. Currie assuming command upon activation. For administration and training purposes, the new unit was attached to the 24th Headquarters and Headquarters Detachment, Special Troops, Camp Shelby. Over the next few months, the unit steadily built up the requisite T/O strength of 38 Officers, 40 Nurses, 1 Warrant Officer and 207 Enlisted Men. An advanced cadre from the 130th General Hospital arrived at Camp Shelby on 3 March to establish and prepare the area for the main unit of the 114th. The unit was at full T/O strength by 8 April 1944, and training was begun immediately. Calisthenics were now a daily occurrence for the new personnel, and lectures were regularly held in tent pitching, general ward duties and medicine. Specialist staff were selected to receive additional training in the following areas, ultimately resulting in their final MOS (Military Occupational Specialty –ed) assignment: treatment of gas casualties, ophthalmology, otorhinolaryngology, orthopedic surgery, plastic and thoracic surgery, urology and dental surgery as well as x-ray and laboratory technical training. The first unit bivouac was staged on 9 June at Biloxi, Mississippi. 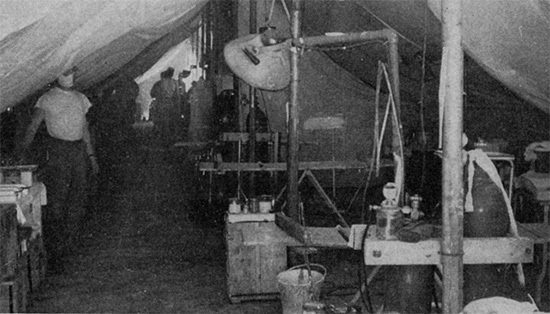 One of the main lessons to be drawn from this bivouac was that in order to optimize light inside of the operating room and other ward tents, a white lining should be erected to the interior of the tent. The unit’s Nurses were tasked with the job of creating such liners, and spent many hours with this task. Unfortunately, due to a logistical error, when the unit embarked for overseas movement, these liners were not packed and additional ones had to be made after the unit became operational in Europe. General view of an operating room set up under canvas in the field. The white cotton liners for the tents can be clearly seen. Training was finally completed on 24 July 1944. During this period of intense training, Lt. Col. Francis F. Viglione replaced Lt. Col. Currie as the unit’s Commanding Officer. Only three days after the unit training had been concluded, the 114th began its mobilization training tests. This series of tests covered 35 different aspects of the unit training cycle, and was performed under simulated battle conditions. On 16 August 1944, a cadre of 44 Enlisted Men and 1 Officer left the unit for the recently activated 139th Evacuation Hospital. Additional training was ongoing into September, with the post facilities at Cp. Shelby being used for medical and surgical training. The last of the training exercises was completed on 21 September 1944. On 23 September 1944 the Commanding Officer received orders to ready the unit for an impending move to the European Theater of Operations. Staff immediately began to pack all hospital equipment for such an assignment. The task of packing was finally completed on 1 November, and the unit was ordered to load all equipment and personnel into boxcars for shipment overseas. The destination was still unclear, but rumors suggested the 114th would be heading to the United Kingdom. Loading and final preparations were completed on 16 November, and the unit left immediately for Camp Miles Standish, Taunton, Massachusetts (Staging Camp for the Boston Port of Embarkation –ed) arriving at 1530 hours the same day. The unit spent a total of 14 days staging at Cp. Miles Standish before embarking from the Commonwealth Pier at the Boston Port of Embarkation onto the USAT Santa Rosa at 1000 hours on 1 December 1944. The vessel departed the harbor at 0800 the following morning, and the 114th personnel were finally informed of their destination; Wales, in the United Kingdom. The trip across the Atlantic was largely uneventful. Approximately 90% of the personnel aboard the vessel became seasick and Nurses from the 114th were recruited as members of the infirmary staff to aid in treating those affected. USAT Santa Rosa arriving into the harbor of Swansea, Wales in 1944. 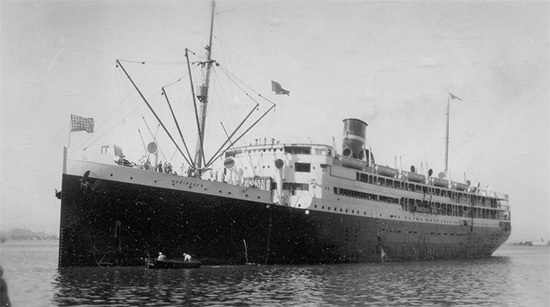 The USAT Santa Rosa docked into the harbor of Swansea, Wales at 0500 on 12 December 1944. The following day, the unit departed Swansea by bus for Aberporth. Upon arrival at the new location, the organization immediately started training for combat. Many of the Hospital’s personnel were placed on detached service with the 12th Hospital Group. On 10 January 1945, the 114th Evac was alerted for combat duty, and in readiness for a move to mainland Europe was assigned to Fifteenth United States Army (thus being relieved from UK Base per Troop Assignment Order No. 17, HQ, Twelfth Army Group –ed). The unit’s equipment was taken from Aberporth, Wales by motor vehicle on 27 January 1945, during one of the worst snowstorms to hit the country in 2 years. At one point, when descending a steep hill, one large two-wheeled autoclave unit broke loose of its coupling and was almost lost. The following day, the unit departed Aberport by train at 2330, for the marshaling area north of Camp Winchester (located north of Southampton, England –ed). The train arrived at the camp at approximately 1300 on 29 January, and the 114th would remain here for a further 9 days. On 30 January 1945, orders were received relieving the 114th of its assignment to the Fifteenth United States Army, and assigning it to the Ninth US Army (per Troop Assignment Order No. 25, HQ, Twelfth Army Group –ed). Photograph of the SS Borinquen, the transport for the 114th Evac Hosp’s Nurses. The Hospital was scheduled to leave the United Kingdom on 3 February 1945, but due to the activity of German U-Boats in the English Channel, the crossing was delayed until the waters became safe. 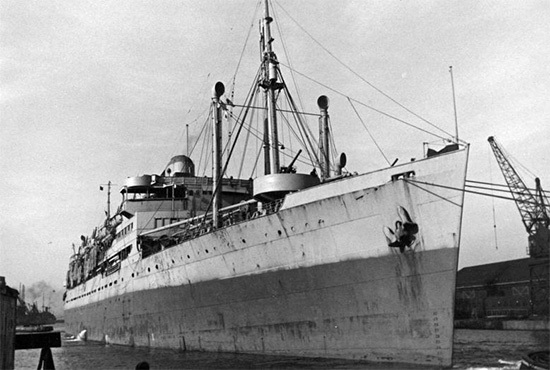 Finally, on 5 February 1945 the unit embarked on the Marquis for Le Havre, France. The vessel left the port at 2210 hours, arriving in France the following morning at approximately 0830. The unit’s Nurses boarded SS Borinquen at noon on 6 February, arriving into Le Havre the following evening at 2300. After debarking at Le Havre, the main body of the 114th was transported by trucks and joined the advance party at approximately 0200 hours, 7 February 1945 in Neufchâtel, France. The trucks unloaded all personnel approximately 1 mile from the area and the combination of fatigue, black-out, tons of heavy equipment and luggage and plenty of soft, deep mud drove the morale of the men to a new temporary low. The Nurses were quartered in an old monastery outside town, approximately 30 miles away. The weather was particularly inclement which did not assist in raising morale; Enlisted personnel were housed in pyramidal tents, and coal was limited to one helmet per person per day. Trees could not be cut down to use as fuel for the limited number of tent heaters, and the unit was not issued any overshoes. The facility was particularly miserable. After 21 days of marches, lectures and training of all kinds, and recreation and movies to keep everyone fully occupied, additional orders were received for the unit’s next move, this time into Germany. The advance equipment detail departed for Herzogenrath, Germany on 18 February 1945. En route, the detail stopped at Charleroi, Belgium for a night’s rest before continuing to the unit’s new station. The facility was a former glider manufacturing plant, and orders had been issued to have the Hospital ready to receive patients by 3 March. Since the Hospital’s equipment had yet to be used since packing everything in the ZI, the advance party had to remove the cosmoline packing from the equipment and sterilize essential surgical equipment immediately. Squad Tents pitched at Camp “Twenty Grand”, Hénouville / Duclair, France. The balance of the unit received its movement orders on 22 February 1945 and early in the morning both Officers and Enlisted Men marched to the nearby town of Duclair, France, and boarded trucks. Upon arrival, they were taken to the station and loaded into “40 and 8s” (French boxcars capable of carrying 40 men or 8 horses “40 hommes et 8 chevaux” –ed). However, rationing became a serious problem and all personnel returned to Camp Twenty Grand (“Cigarette Camp” located at Hénouville / Duclair, France, area located between Rouen and Le Havre –ed) for a further five-day wait. On 27 February, Officers and Enlisted Men were taken by truck to Rouen. Upon arrival, they were once again loaded into boxcars with a total of 20 men being placed in each car. The train took 2 ½ days to reach Herzogenrath and the only available food for the whole journey was cold C-rations. The main unit finally arrived at the new station at approximately 1530 hours on 2 March 1945. The organization received authorization from Ninth Army to hire 40 civilians to be used to perform various functions around the Hospital. They couldn’t believe there would be more food the next day and hid bread and pancakes under their pillows. The workers refused to give up their small square of hard bread when they arrived at the camp. Most of the workers were assigned to the kitchen in an effort to allow valuable staff to perform essential work in the Hospital. At the same time, one Platoon of the 583d Motor Ambulance Company with 1 Officer and 16 Enlisted Men were attached to the 114th Evacuation Hospital for the evacuation of patients to the rear. After a great amount of effort from all involved, the hospital was finally opened at 1800 hours on 2 March 1945. The first patient was a German soldier, but staff at the facility were not authorized to register him until the unit had received its first American casualty. The Hospital soon received its first patients from the Roer pocket, but orders were received for the unit to once again move stations, and as such the Hospital was closed at 1200 hours on 17 March. In total, the 114th had admitted 645 patients, they were as follows: 558 US personnel, 7 British and Allied troops, 67 German casualties and 13 civilians. 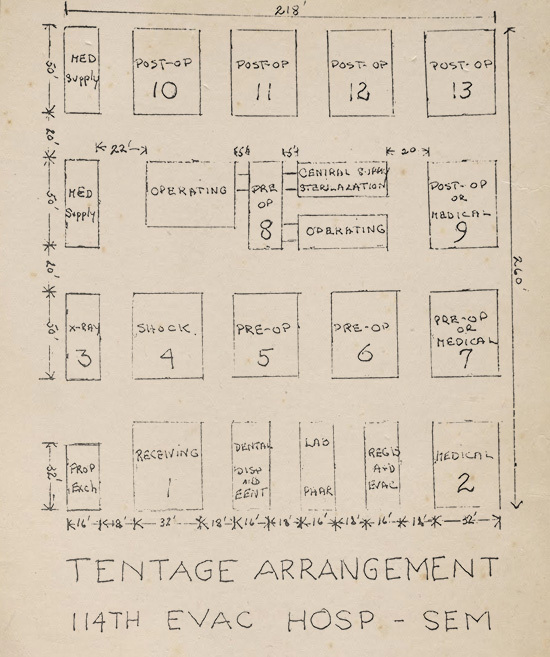 Hand-drawn layout of the 114th Evacuation Hospital’s tent set up in the field. The Hospital’s equipment was immediately packed away ready for transport, and on 20 March 1945 the unit left Herzogenrath at 1530 hours for its next location; a small area at Geldern, Germany. The group travelled by 2 ½-ton Trucks to the new site, and arrived at 1730 hours the same day. At this time, the facility was only 9 miles from the front lines, and was instructed that casualties would be imminent from the Rhine river crossing offensive. 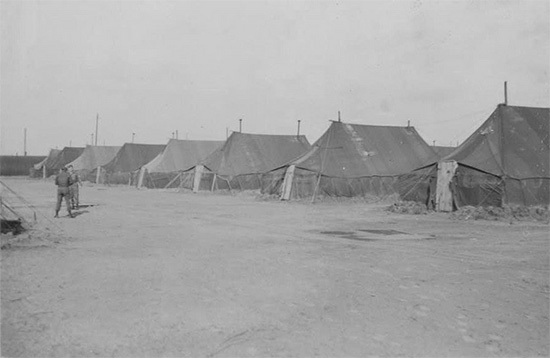 The facility was set up in tents, with Hospital Ward Tents being pitched in double rows with the adjoining side walls rolled up and supported by poles, thus producing a large tent capable of handling forty patients. The Nurses made the second set of white sheet liners for the operating rooms and the site was soon turned around into a fully-functional Evacuation Hospital. The first patients were received on 26 March. By 0730 the following morning, the Hospital had a total of 500 patients. There were over 200 patients backlogged for surgery and the OR staff worked 24-hour shifts in an attempt to clear the list. Members of the Medical Administrative Corps were used as triage personnel, and special teams of shock, surgical and x-ray personnel were attached from the 5th Auxiliary Surgical Group to help deal with the influx of patients and severe backlog. After 17 days of operation near Geldern, the facility was officially closed on 3 April 1945. All patients were transferred to Evacuation and General Hospitals in the surrounding area and the unit left Geldern at 1430 hours on 6 April for a new location 2 miles south of Beckum, Germany. The 114th Evacuation Hospital crossed the Rhine at 1830 the same day. The 114th arrived at the new site on 8 April 1945 at approximately 0700 hours, and a quick turn around saw the unit receive its first patients by noon. Following an inspection at the facility by the Inspector General, and based upon the accommodation and ration problems experienced by the unit at Camp Twenty Grand, plus problems with the professional staff, Lt. Col Viglione was relieved of his command. Lt. Col. Clyde S. Wilson was assigned as the new Commanding Officer. On 9 May 1945, following the official announcement of the German surrender the previous day, the unit began its V-E Day celebrations. A special dinner was organized for all personnel and patients. Two days later, the facility closed, having admitted a total of 2,624 patients. The vast majority were US soldiers, but a large proportion were not combat casualties. A nearby battalion had ‘liberated’ some German schnapps and the first two soldiers to arrive were already found dead. The third died shortly after arrival and of the 51 that arrived thereafter, a total of 9 died. The liquor worked rapidly on the patients and over the short space of a few hours they went from apparent good health to complete blindness, to death, the result of alcohol poisoning. The unit was once again on the move and on 11 May reached a site located east of Rheda, Germany, where it established a new Hospital in an abandoned factory. The first patients arrived the following day. It was at this location that the Venereal Disease Section of the 63d Field Hospital, under the command of Capt. Andrew W. Cannava joined the 114th Evac Hosp. Under this new assignment, the Hospital handled 841 V.D. admissions and had 616 dispositions with an average daily census of 250. 258 cases were gonorrhea, 134 syphilis, and the remainder were divided between chancroid, granuloma and inguinale. 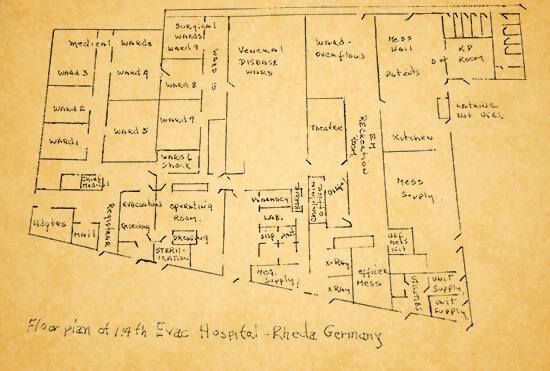 Illustration prepared by an unidentified member of the unit showing the floor plan of the 114th Evacuation Hospital’s facility in Rheda, Germany. 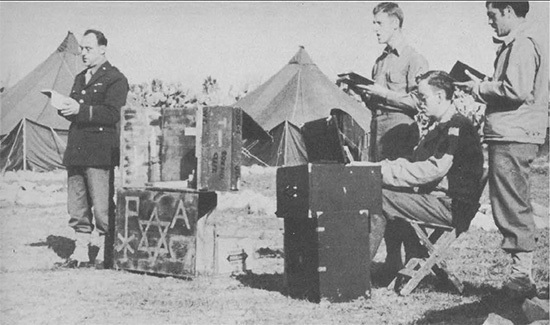 During the stay at Rheda, unit personnel were authorized to occupy German homes, and seven or eight individuals were assigned to each home in the surrounding areas. By 31 May 1945, the Hospital handled a total of 6,116 patients. 1,066 were battle casualties, 1,050 injuries and 4,000 diseases. A total of 1,726 operations were performed in this period. On 14 June 1945, the 114th Evacuation Hospital was relieved of its duties with Ninth US Army, and assigned to Seventh United States Army. On the same day, all unit personnel were awarded with the Bronze Star Medal for their service in the Rhineland campaign, receiving an additional miniature star device for the European-African-Middle Eastern Campaign Ribbon on 25 June 1945. On 27 June, the facility was officially closed, and all personnel vacated the German homes. The unit finally left Rheda at 0730 hours on 28 June 1945 for its new location in Limburg-an-der-Lahn, Germany. Upon arrival at Limburg-an-der-Lahn, the unit opened its facility in a Roman Catholic School at 2030 hours on 29 March 1945. The Nuns were used in various positions throughout the complex. Patients requiring prolonged care or diagnostic procedures were evacuated to the 317th Station Hospital in Wiesbaden, or the 95th General Hospital in Frankfurt. On 1 September, the unit finalized the taking over of 2 additional buildings in Limburg; the opera house was used as the Officers’ Club and was required to sponsor USO shows in the auditorium for all military assigned personnel in the area. On 23 September, Lt. Col. Wilson returned to the United States, and thus, Lt. Col. Frank C. Svoboda assumed the role as Commanding Officer of the 114th Evacuation Hospital. Throughout September and October, the facility saw numerous personnel changes as existing staff received sufficiently high ASR scores to become eligible for return home. By 5 October, orders had been received from HQ, ETOUSA for the facility to be returned to the local catholic diocese. This was in accordance with military provisions that German educational institutions be vacated at the earliest possible date in order to enable the German populace to resume an educational program which had been disrupted by the war. On 29 October 1945, the 114th moved by shuttle to Weilburg, 15 miles from Limburg, and occupied a large facility previous used by the German Army as an Infantry Training School. The buildings were in very poor condition upon arrival, and many repairs and alterations were made prior to the initial movement. None of the buildings had running water for drinking or the washing of patients. Once this was corrected, the unit was authorized to use Station Hospital-type equipment, which helped the morale of the unit as this meant a smaller operation and fewer operating rooms were required. 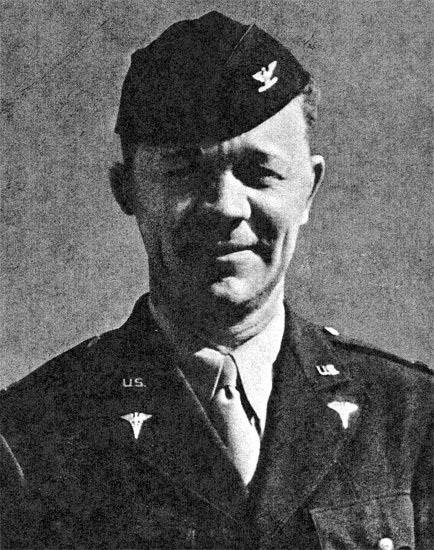 Col. Allan A. Craig, who assumed command of the 114th Evac Hosp in November 1945, after Lt. Col. Svoboda was returned to the ZI. In November, Lt. Col. Svoboda was returned to the ZI, and thus Col. Allan A. Craig assumed command of the 114th Evacuation Hospital. With the Redeployment program having taken great strides, the Hospital was lacking sufficient personnel to function efficiently for the best interest of the patients. Civilians were employed to supplement the loss of military staff, but in January 1946 orders were received from Headquarters, Seventh United States Army to close and deactivate the 114th Evacuation Hospital. All equipment was to be divided for two additional German Hospitals. Personnel lacking sufficient ASR scores for rotation to the US were transferred to the 97th General Hospital in Frankfurt. 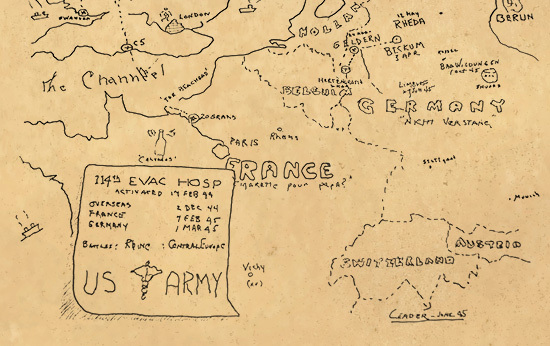 The 114th Evacuation Hospital was officially inactivated on 25 January 1946, and all remaining personnel were assigned to the 8th Convalescent Hospital. Capt. Harold Washburn, MAC, was the Detachment Commander. When the unit began functioning on 1 March in Herzogenrath, a permanent 24-hour armed guard was maintained, a shower was put into operation with hot water from a portable disinfecting unit and a unit Post Exchange was established, with two Enlisted Men assigned. The Post Exchange handled Coca Cola and beer, along with the usual items. The Detachment was expertly trained and after 1 March it performed its mission with both enthusiasm and vigor. The help of 16 civilian workers aided the Mess Department, under the direction of Lt. Wysocki considerably. This outside help was especially important during the periods when the patient census exceeded 400. During the month of March 1945, the first month of operation, the number of meals served jumped to 45,000 (from 25,000 in January, and 26,000 in February). In April, 57,000 and in May an all time high of 80,000 was reached. The food was adequate and well prepared. Lt. Rogers, as Supply Officer, was responsible for overseeing that all personnel were fully equipped and that all the unit and medical equipment was on hand and serviceable. This Department was a sea of activity during the month of January 1945 while the unit prepared for the move to the continent. It was divided into three parts, namely Medical Supply, Unit Supply and Utilities. 49 Ward Tents, 40 Squad Tents and numerous smaller tents were on hand, some of which were in excess of the T/O & E. The excess tentage provided additional wards during the periods of heavy patient loads and also afforded additional tentage for various facilities such as day rooms, theater, chapel, etc. 104 oil burning tent stoves were also acquired which added further comfort to the Hospital’s personnel. The Motor Pool, with Lt. Rein in charge, functioned efficiently with 22 2 ½-ton Trucks, 2 Dodge Weapons Carriers and 3 Jeeps. This being a semi-mobile unit, all the equipment could be packed on trucks and moved at one time. All of the moves on the continent, however, were made with the help of vehicles from neighboring units. This expedited the moves and made it possible to close the old installations and open at the new location, when necessary, without ceasing operation. Two 750-gallon water trucks and 250-gallon water trailers provided the water supply while in tents. The water trucks, equipped with ample hose and the necessary equipment, also served as fire trucks. The only difficulty in this Department was the lack of small vehicles. This was helped considerably, however, by the permission from Ninth Army Headquarters to retain and use one captured vehicle. Jewish Chaplain Karl Scheufler leading a worship service at an unidentified Evacuation Hospital. Photograph taken somewhere in France, 1944. In the first five months of its operation, the 114th had 3 different Chaplains assigned to it. The first one was transferred, the second evacuated because of sickness, and the third, Chaplain Charles Daniels (Protestant) remained with the unit until it was inactivated. His work was done efficiently and enthusiastically and with the help of Jewish and Catholic Chaplains from the neighboring units, services were held regularly for men of all faiths. The entire Ward Section was under the direct control of Lt. Col. Svoboda, the Chief of Medical Service, and the Department was run in an extremely efficient manner. During the periods of heavy admissions, the Medical Officers, Nurses and Enlisted Men were divided into 12-hour day and night shifts running from 0800 to 2000 and 2000 to 0800 hours. Each ward was uniformly organized. There was a specific place for everything and with the constant effort of both wardmen and civilian workers, one of which was assigned to each ward, they were kept clean and orderly at all times. During the periods of heavy admissions this was the busiest Section in the Hospital and Lt. Col. Sheldon, the Chief of Surgical Service, expertly administered it. In Herzogenrath a total of 207 operations were performed, in Geldern 296, in Beckum 846, and in Rheda 377, making a grand total of 1,726 operations. While in the field the operating section utilized 4 Ward Tents, one for preparing patients for operation, one for abdominal, thoracic and maxillo-facial surgery, one tent for sterile supplies and a double Ward Tent for general surgery. Salvage canvas was used to cover the ground. Emphasis was placed on thorough debridement of wounds and removal of all no-viable tissue. This Service was divided into two parts, namely oral surgery and general dentistry. The oral surgery, which was directed by Maj. Rankow, the Chief of Dental Service, became an integral part of the plastic and maxillo-facial team of the surgical section (in conjunction with Capt. Kleiman of the Surgical Section) and handled all injuries of the bones and soft tissues of the face. The use of intermaxillary elastic traction permitted thorough fixation but had to be supplemented in cases of severely commuted fractures with circumferential or internal wiring. 578 oral examinations were made during the period, 317 of which were emergency and 261 routine. There were 158 restorations of carious teeth, 102 prophylaxes and removals of calculus and 120 treatments for gingivitis. The Dental Section made exhaustive studies of the use of penicillin and it was found that a decided advantage to oral tissue was derived from the use of penicillin drops for the treatment of stomatitis. Similarly the systematic use of penicillin resulted in minimal postoperative sequela following the removal of impacted and mandibular teeth. Between 12 and 31 May 1945 there were a total of 841 VD admissions and 616 dispositions with an average daily census of 250. One large unpartitioned ward was used for the VD cases that facilitated their care, treatment and disposition. A separate wash room was constructed inside the ward and separate external latrines were maintained for the VD patients. The efficiency of this service was beyond reproach – 99.9% of the cases were returned to full duty and a mere 0.1% had to be evacuated to the ZI. All clothing was removed from the patients and they wore pajamas, which helped to keep them from wandering around the town. This Section, under Maj. John Doering, did not begin functioning until 13 May 1945 when the unit was stationed in Rheda. Between 13 and 31 May there were a total of 82 admissions with 32 returned to full duty, 2 transfers to other wards because of organic disease, 17 cases remaining and 33 evacuated for further treatment. The patients were predominantly neurotics, both acute and chronic, and of these the majority were anxiety states, some with conversion symptoms. Many chronic alcoholics were admitted for study as well as cases of acute alcoholism for treatment. The remainder included psychoses, epilepsy, homosexuality and mental deficiency. Maj. Doering was well-trained and ran a superior department. Personnel shortage was a chronic problem in this busy Section and it became acute when the VD Section was added. This was eliminated to a great extent, however, by the addition of one clerk and one technician over and above T/O, besides two civilian laborers for washing of glassware and general cleaning. The number of procedures handled after the VD Section was added, jumped from 1,300 per month to 4,100. A total of 6,728 procedures were completed for the period. 1,756 of which were urinalyses, 1,596 gonococcus smears, 1,154 hematologies, 669 darkfield examinations, 378 gonococcus cultures, 365 cross matches and the remainder were divided between miscellaneous smears and cultures, spinal fluid routine and frei tests. In addition, a total of 41 autopsies were completed during this period. The Pharmacy was also kept busy. A total of 5,595 prescriptions were filled; 1,496 in March, 1,612 in April and 2,397 in May 1945. Approximately 40% of these were not prepared drugs but were compounded in the Pharmacy. Approximately 16% of all prescriptions filled were for outpatients or other medical installations in the area. One Officer, Capt. Bernard Kleiman, and one Enlisted Man ran this Department, handling on average 25 hospital patients and 25 outpatients each day. A dark room was set up for translumination of sinuses and it was found that a sinus x-ray in the Waters position only was sufficient for general diagnostic work. The use of Proetz displacement helped immeasurably in handling many of the outpatient problems, and the use of penicillin helped to cure many cases of peri-tonsillar abscess. The use of a solution of penicillin (250 units per cc with ½% pontocaine used at half-hour intervals) lessened considerably the number of days of hospitalization for acute, purulent, conjunctivitis cases. 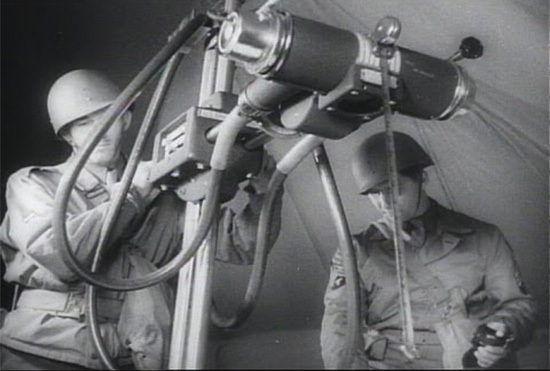 Two technicians prepare a US Army Portable X-Ray Machine for use in the field at an unidentified field hospital during training in the ZI. This Section, during periods when battle casualties were pouring through the Receiving Department by the hundreds, was one of the busiest and its sole Officer, Capt. Samuel Nelson, 3 Technicians and 1 Clerk worked day and night in order not to retard the Operating and Ward Sections. Voluntarily they worked for 18 and 20 hour stretches during those busy days, and only after the backlog was eliminated did they drop down to a normal 12-hour day and night shift. During the month of March 1945, 752 patients received x-rays, in April 1,608 and in May 1,868. Best, Duncan L. Fowler, Julian W. Prohl, Carl J.
Boulton, Frederick J. Gehris, Leroy A. Rankow, Robin M.
Boyer, James N. Haines, Robert A. Rein, Harold L.
Bradley, Thomas Hill, Willard T. Rodgers, Robert M.
Brayton, Donald F. Hodgman, Albert B. Rose, Herman G.
Brescia, Michael A. Hoty, Charles N. Rosenstein, Jack J.
Brixey, Albin M., Jr. James, Dorrance S. Rudolph, John F.
Cannova, Andrew W. Kannan, Michael J. Schweppe, John S.
Carrucci, Gabriel Keith, Rockwood Spellman, Clarent W.
Chapin, Louis D. Kleiber, Joseph F. (WO) Stalonas, Anthony J.
Craig, Allan A. Levin, Bernard E. Svoboda, Frank C.
Currie, Raymond E. Leviticus, Rene Thompson, James T.
Daniels, Charles O. Ludwig, Edward W. Tsuhasaki, Masonobu G.
Diether, Irving S. McClure, Coye W. Turnblazer, Charles B.
Doering, John A. McCrudden, William P. Viglione, Francis F.
Downing, Collins McGrovern, Edward H. Washburn, Harold E.
Elliott, Robert W. Miceli, Peter A. Wenger, Harold A.
Ensign, William G. Nelson, Samuel Wilson, Charles A.
Fackler, Paul A. Nicoll, Charles A. Wilson, Clyde S.
Flett, James Polley, Theodore Z. Wysocki, Bernard S.
Flynn, Eugene Pollock, Leon E. Zeller, Paul J. 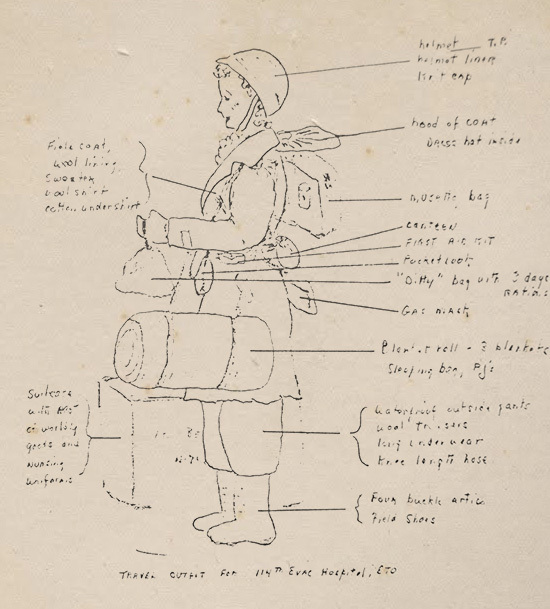 Sketch prepared by an unidentified member of the 114th Evac Hosp showing the typical field uniform of the unit’s Nurses. Albot, Dorothy Hoffman, Jeanne E. Reznor, Alice P.
Boyle, Mary A. Junk, Catherine Scarem, Elaine M.
Cassano, Florence L. Maitska, Karessa W. Sedgwick, Ruth I.
Conrad, Mary A. Marwine, Beulah L. Shinham, Mary F.
Croyle, Betty Mathys, Anne L. Shive, Eleanor L.
Curcio, Louise T. Meitske, Karessan W. Shortt, Grace M.
Cuthbert, Betty Micklus, Dorothy Stein, Anne E.
Ditman, Martha E. Miner, Florence Z. Thomas, Virginia R.
Doherty, Grace I. Moritz, Dorraine K. Thompson, Florence E.
Donofrio, Doris V. Morriss, Claire E. Thompson, Madeline B. East, Marie E, Nielson, Marcella C. Tonet, Edith T.
Flick, Ruth J. Piazezze, Vera E. Weinstein, Rose R.
Fulcher, Jean E. Piser, Phyllis R. Wilson, Ruth C.
Fulton, Betty Povilaitis, Mary M. Wright, Marie R.
Henley, Merle Raitanen, Olga D.
Abbott, John J. Felts, John M. McKinney, Donald B.
Abraham, Paul J. Filiupeit, Albert A. Macmillan, Robert W.
Adams, Arthur J. Fink, Louis Maffett, Emory G.
Allen, George A. Flaharty, Dale S. Marshall, Robert E.
Anderson, Boyd D. Flowers, Clifford G. Martin, Robert J.
Andrews, Kermit M. Folsom, Thomas K. Matthews, Norman L.
Angeli, Rudolph Forer, Lionel O. Milburn, Roger C.
Appleyard, John H. Frisch, Joseph E. Miller, Wayne C.
Ashby, Eugene K. Gagne, Adalbert J. Mobley, Eugene O.
Ashby, Warren Gant, Robert L. Mockabee, Elmer F.
Ashwell, Lloyd Gear, Lee R. Modoono, Edward E.
Atkinson, Loy E. George, Allen P. Montross, Robert A.
Barker, Bernard H. Gitterman, Irving Morrison, Herbet R.
Ball, James B. Glazner, George Mote, William N.
Balter, George Goldberg, Max Mundell, Charles G.
Barnett, Francis W. Grego, Frank Nelson, Carl N.
Barton, Matthew A. Gress, Carl F. Newell, Francis J.
Baumunk, Edward T. Griffin, Thomas W. Noel, Joseph A.
Bechman, Edwin J. Griffith, Owen W. Noone, Joseph C.
Bell, James B. Gruder, I. E. Oberlander, Wilbur E.
Berkowitz, L. M. Guess, E. L. Olson, Clarence E.
Birdsong, Benjamin M. Guile, M. R. Palmer, Lindsay L.
Bischoff, Jack M. Haanpaa, Arthur R. Parker, David V.
Blair, Thomas F. III Hass, John M. III Parkerson, C. W.
Boehm, Edward G. Hadley, David H. Partner, William P.
Bohnak, Stephen J. Haines, Kenneth H. Patterson, Richard B.
Bowers, Stewart C. Halamik, Vladimir B. Penn, William H.
Braddy, Jessie T. Hanlon, Lee J. Pollard, Lawrence A.
Braude, Arthur E. Hanrahan, John T. Price, Gerald M.
Bray, Roy H., Jr. Hansell, R. Quillen, Gilbert C.
Brehm, Harold E. Hanson, John Rathbone, Wayne W.
Brinkley, Lemuel R. Harvey, Theodore G. Repucci, J. R.
Brossman, Charles W. Hartman, Edmund J. Reynolds, Howard W.
Bumpas, Andrew G. Haugh, Milan E. Rhodes, Robert R.
Burkett, Robert F. Hendricks, Wilfred Rinker, Charles T.
Callista, R. L. Hertzberg, Ernest G. Rountree, Edward T.
Cameron, Joseph M. Hicks, Carrel Salvaggio, George J.
Cannuli, Eugene A. Hilbert, Edward Scala, Joseph E.
Carew, Martin E. Hild, Raymond L. Shore, Rubin L.
Carfora, Mario W. Hilditch, Henry J. Skidmore, Robert H.
Carrozza, Eugene W. Hinderer, John C. Smith, Stead L.
Casper, Clayton Hitaffer, Francis L. Smyzer, P.
Cassida, Ernest R. Hockbert, Marvin S. Solomon, Melvin A.
Cawthorn, E. W. Holdsworth, William C. Sparks, Glenn M.
Chaffin, Joe F. Holifield, Charlie M. Spence, Gerald L.
Cheinstein, Lawrence C. Holsing, J. Spicer, Edwin J.
Clagget, Vernon L. Holtzapple, Harris Sprenkel, Wilson J., Jr.
Clark, Michael A. Holtzapple, Harold E. Stanfield, Woodrow W.
Clendening, John L. Hoopler, W. P. Station, David W.
Cockrell, Wayne K. Horan, William E. Stein, Harry M.
Coffey, Thomas E. Hornbrook, Harry Stetson, Orrin J.
Cohen, John Horton, George A. Stogsdill, Norman C.
Collins, Paul H. Hudson, Robert E. Suhr, Lester H.
Conhaim, Louis E. Hurst Sullivan, Thomas R.
Cooper, Clarence E. Hutson, Benedict K. Swisher, Ralph A.
Costello, Tony Inkrote, Preston E. Sweigert, Eugene R.
Cully, Raymond L. Ivers, John C. Sykes, Earl R.
Cummings, David V. Johnson, John R. Tainsky, Irving A.
Cutler, Bernard Jones, Leslie L. Taylor, Freddie E.
Cyran, Maryan J, Josefsberh, Albert Taylor, Sherwood B.
Dahler, Donald R. Joseph, Thomas G. Taylor, William J.
Dall, Robert B. Kasper, Frank Tibbe, Louis R.
Darras, Sam P. Kaye, Daniel Timms, William H.
Davenport, William C. Keighley, Stephen W. Tripplet, Thomas L.
Davis, Roy F. Keller, Palmer E. Trump, Hersdey W., Jr.
Deacon, Walter E. Kettles, Robert C. Turek, Edward E.
Decker, James E. Knotts, Eugene Urankar, Frank J.
Dellinger, Nevin W. Knowles, John W. Valenti, Anthony J.
Del Pesco, Falfonzo Konopky, Daniel Van Doren, George W.
Dixon, Edward F. Kornbau, Lloyd E. Vericella, Samuel A. Dollar, Donald Krueger, Richard H. Webb, Thomas P.
Dougherty, Henry J. Kuny, C. N. Weiss, Charles M.
Dover, Clyde O. Labita, Joseph J. Westrbook, James E.
Dunn, Sidney S. Landis, Dwigth L. White, Charles L.
Durost, Harvey W. Laphan, Ralph C. Whitton, William G.
Eberley, Ervin M. Leader, Henry Wilhelm, Charles C.
Eckerle, George Leitz, John O. Willett, William C.
Eckes, Frederick E. Leverton, James A. Winski, Stanley J.
Ehrlick, J. Lewis, Kenneth W. Wright, John W., Jr.
Elrod, Willie F. Long, George B. Yekel, Paul F.
Evans, Jimmy N. Louis, George E. Zartman, John A.
Federenko, Edward W. Love, George Ziesenhene, George W.
Feinman, Stanely M. Lutz, Ross A. Zimmerman, Joseph H.
Feldman, Albert E. McCauley, Robert J.
Fetrow, Richard G. McCauley, Roger E.
Map showing the complete movements of the 114th Evac Hosp throughout Europe.